Tom Gates is a master of excuses, expert doodler, comic story writer extraordinaire – and the bane of his grumpy teacher Mr Fullerman’s life. And in his wacky journal of scribbles and silliness, you’ll find all sorts of comic craziness to make you groan with glee! Will Tom ever manage to get his homework in on time, avoid the rage of his teacher – AND impress Amy Porter, who sits next to him? Warning! Do not attempt to read this in public. You will snigger loudly! 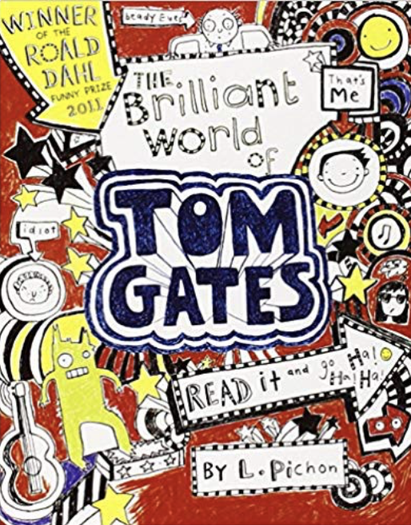 I'm TOM GATES and here's a SPEEDY look into my BRILLIANT world that includes: BEADY EYED teachers. An ANNOYING boy (Marcus Meldrew.) FANTASTIC bands (DOGZOMBIES and DUDE3) A Grumpy sister called Delia. AND I nearly forgot caramel wafers. Mmmmm, Mmmm, Mmmm.